On November 8, 1519, the Spanish conquistador Hernando Cortés first met Montezuma, the Aztec emperor, at the entrance to the capital city of Tenochtitlan. This introduction—the prelude to the Spanish seizure of Mexico City and to European colonization of the mainland of the Americas—has long been the symbol of Cortés’s bold and brilliant military genius. Montezuma, on the other hand, is remembered as a coward who gave away a vast empire and touched off a wave of colonial invasions across the hemisphere. But is this really what happened? 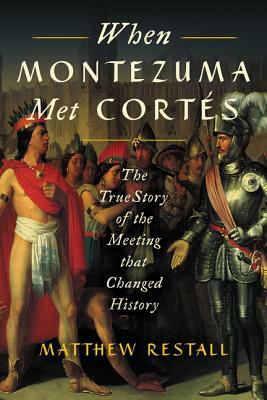 In a departure from traditional tellings, When Montezuma Met Cortés uses “the Meeting”—as Restall dubs their first encounter—as the entry point into a comprehensive reevaluation of both Cortés and Montezuma. Drawing on rare primary sources and overlooked accounts by conquistadors and Aztecs alike, Restall explores Cortés’s and Montezuma’s posthumous reputations, their achievements and failures, and the worlds in which they lived—leading, step by step, to a dramatic inversion of the old story. As Restall takes us through this sweeping, revisionist account of a pivotal moment in modern civilization, he calls into question our view of the history of the Americas, and, indeed, of history itself. Matthew Restall is the Edwin Erle Sparks Professor of Latin American History and director of Latin American studies at Pennsylvania State University. He is president of the American Society for Ethnohistory, and has held fellowships from the Guggenheim Foundation, the Institute for Advanced Study at Princeton, the John Carter Brown Library, the Library of Congress, and the National Endowment for the Humanities. He has written twenty books and sixty articles and essays on the histories of the Mayas, of Africans in Spanish America, and of the Spanish Conquest. He lives in State College, Pennsylvania, with his wife and the youngest of his four daughters.